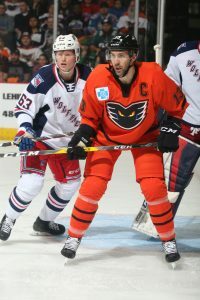 Lehigh Valley, Pa. – The Lehigh Valley Phantoms (39-30-4-3) concluded their fifth season in Lehigh Valley with a five-game winning streak as the top the Hartford Wolf Pack (29-35-7-4) with a 3-2 shootout victory. Colin McDonald extended his goal-streak to four games and David Kase scored late in the third to tie the game. Matthew Strome potted the shootout winner as Mike McKenna came up with 29 saves in the victory. The Lehigh Valley fans have shown their tremendous support all season, and they displayed that once again in the final game of the regular season, selling out the PPL Center for the 15th time this season. The Phantoms felt the crowd’s energy early, really applying the pressure on Hartford and getting a couple good looks early in the period. They registered nine shots in the opening frame but were unable to beat Adam Huska. In the final moments of the opening frame the Wolf Pack were able to get on the board with a weird goal that just snuck by Mike McKenna. With 31.7 seconds remaining, Ryan Dmowski threw a puck on net that McKenna was able to get a piece of but not secure. The puck fluttered up into the air and landed on the wrong side of the goal line to give the Wolf Pack a 1-0 lead. After Shawn St. Amant layed a big hit from behind on Philip Samuelsson, Philippe Myers immediately made him answer for it as the 6-foot-5 defenseman dropped the gloves. With both players in the box for fighting, Hartford was able to take a 2-0 lead as Lewis Zerter-Gossage was able to control a loose puck in front of the crease and find the back of the net. Another big hit from the Wolf Pack would cause a Phantoms player to drop the gloves, this time is was Greg Carey coming to the defense of Chris Conner. The Phantoms leading goal scorer is usually known for his soft hands, but he was able to land some heavy rights on Brandon Crawley to further validate why he was selected as the 2018-19 Fan Favorite. The Phantoms were not ready to let the season end quite yet as David Kase tied the game up with his eight goal of the season. Kase was able to beat the First-Team All-Star John Gilmour and turn on the jets down the right side. He fired a shot from the bottom of the circle that squeezed through Huska to tie the game 2-2 and force overtime for 12th time this season. 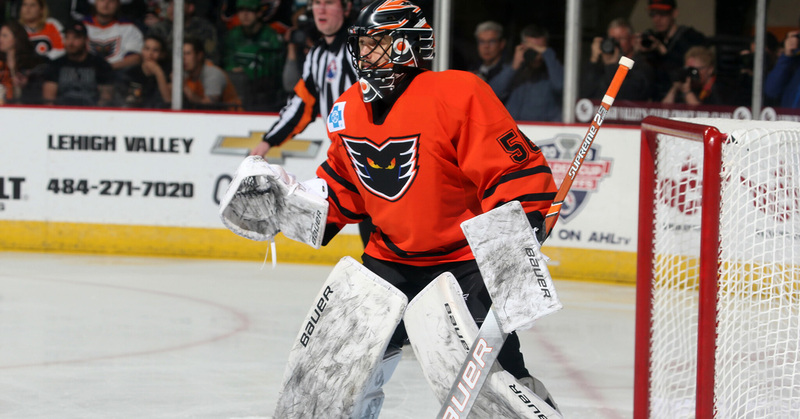 Mike McKenna came up huge in overtime, making four saves for the Phantoms, and then shut the door on all three Wolf Pack shooters during the shootout. Matthew Strome scored the lone goal in the shootout as the Phantoms won 3-2 to conclude the season with a five-game winning streak. NEXT TIME OUT: Phantoms fans will have a chance to leave their mark on PPL Center for the first time ever as we welcome fans to paint the ice! Starting on Monday from 4:00 p.m. – 7:00 p.m for all of our season ticket holders, and then on Tuesday from 11:00 a.m. – 1:00 p.m. and 4:00 p.m. to 7:00 p.m. for all Lehigh Valley fans. Come down and paint your name on the PPL Center ice!